The Confederate statue outside the Loudoun County Courthouse in Leesburg, Virginia, has been vandalized, police say. 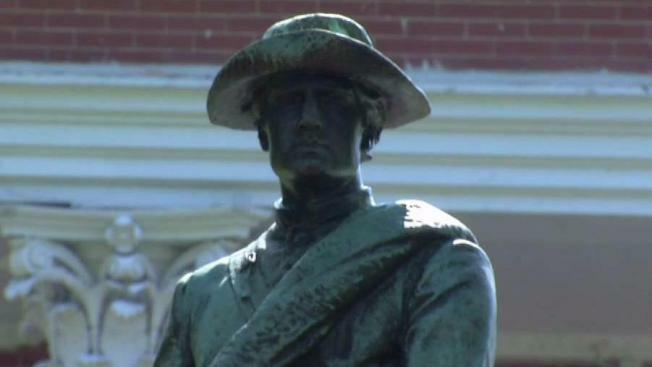 Spray painted graffiti that read "F--- This" with an arrow pointing up to the statue of a Confederate soldier was found Thursday, the Loudoun County Sheriff's Office said Thursday morning. The graffiti is believed to have occurred after midnight Thursday. News of the vandalism comes as President Donald Trump calls for Confederate monuments around the country to remain in place. The graffiti is being removed now. There was no permanent damage to the statue, police say. Near a statue of a Confederate soldier that was vandalized in Leesburg, residents say they want a civil conversation about where Confederate monuments should be located -- not property damage. News4's Julie Carey reports. Anyone with information for police is asked to call 703-777-0475. 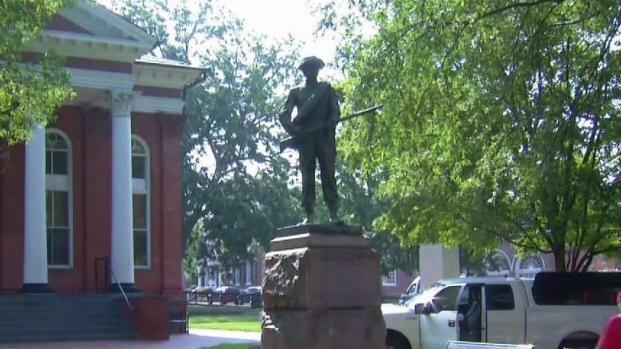 The statue of a Confederate soldier has stood outside the courthouse in Leesburg since 1908, and it is part of the fiery debate about Confederate symbols on public land, News4's Julie Carey reported in June. When Loudoun NAACP President Phillip Thompson looks at the Confederate soldiers memorial in Loudoun County on the courthouse grounds, he sees something very different than Becky Fleming, the president of the Lee chapter of the United Daughters of the Confederacy. “They were trying to send a message, at that point, in 1908 that this is white Virginia, and we are going to run it the way we are going to run it,” said Thompson. Inspired by monument battles in cities like New Orleans and Charlottesville, Virginia, the NAACP sought an updated legal opinion from the county about whether the statue could be moved. Thompson sought to see it relocated to the Ball's Bluff National Cemetery, a site where Confederate and Union soldiers were buried after a Civil War battle in 1861. Loudoun County Supervisor Kristen Umstattd made a legal inquiry on behalf of the NAACP. Despite her personal belief the statue should be moved, she said a 1998 Virginia state law bars the removal of memorials. Thompson questioned whether the law really applies retroactively to memorials built before 1998. Umstattd said she will be watching a case in Charlottesville closely, where those who want to remove a statue of Robert E Lee from a park have taken the case to court. “If the courts decide that Charlottesville can move that statue, then I think this statue's position on the courthouse grounds can come in to question,” Umstattd said. Fleming said the renewed debate dredges up hard feelings. In 2015, the NAACP raised this statue issue and got permission and funding to add informational plaques or monuments on the courthouse lawn about the Underground Railroad's presence and slavery in Loudoun County. Those plaques have not yet been created.